Fairview Mountain is one of the few mountains worthy of the name that has a hiking trail to its summit. 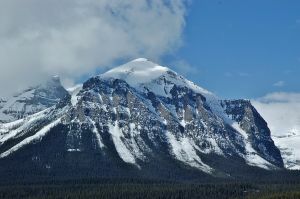 Although it presents a set of cliffs to the viewer on the shore of Lake Louise, the 5 km trail leads around the back to form a Class 1 route to the top. A metal plaque affixed to a summit boulder warns against the common error of short-cutting down the north side toward the end of the lake; apparently many rescues have been needed by those who have tried. The switchbacking trail from the Saddle is quicker, though longer, than direct routes up the rockfall that is reached first. From the side that the trail ascends, Fairview seems more like a pile of rubble than solid rock. It is highly likely that this peak saw its first ascent in prehistoric times by an adventurous aboriginal hunter. Name Notes: Named in 1894 by Walter D. Wilcox presumably because of the views from the summit.